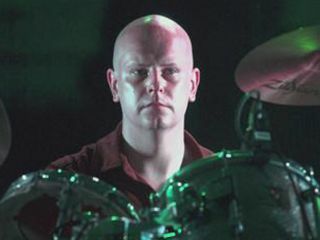 Looks like Thom Yorke and Jonny Greenwood aren't the only Radiohead members to have all the solo fun: drummer Phil Selway is recording an album of his own in the band's Oxfordshire studio. Selway, who sings on the as-yet-untitled record, is working with Wilco members Glenn Kotche and Pat Sansone, as well as 4AD vet, multi-instrumentalist Lisa Germano. Bassist Sebastian Steinberg is also said to be contributing. While there's still no release date set, and no mention of how Selway plans to distrbute the album, he has been testing some songs out at gigs. Check out the video below in which Selway, backed up by Neil Finn on keyboards, debuts a selection called The Witching Hour at Finn's 7 Worlds Collide project in London last month. Pretty sweet.